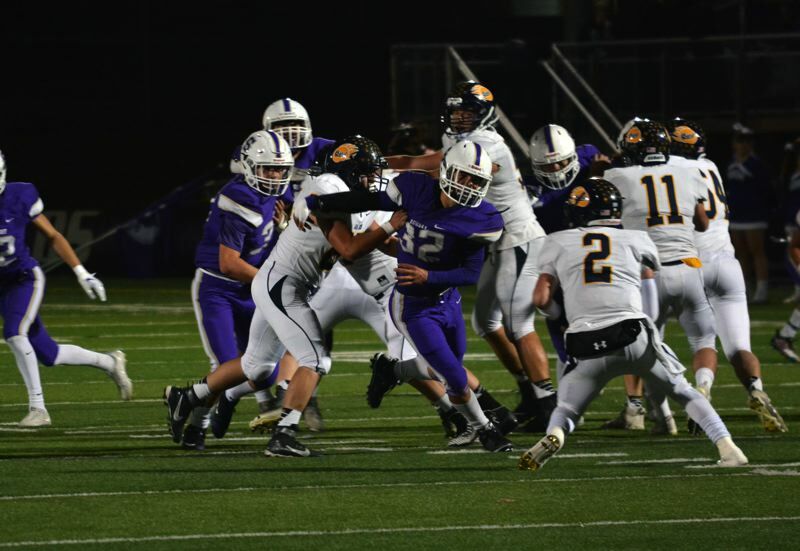 A young quarterback's best friend is a gashing rushing attack coupled with a defense and special teams that can tilt contests with game-changing plays. It's a well-worn football cliche, but when a signal caller is making his first playoff start, the old adage rings true. Entrusted with helping his Apollo squad avoid early elimination, Sunset junior quarterback Callum Craig leaned on his supporting cast for the first half against Bend in the first round of the Class 6A playoffs on Friday. And like any team that has ambitions of playing past the first week of November, the Apollos answered the call collectively. Senior running back Kadin Williams ran for two scores, the Sunset special teams unit forced a safety and the Apollo defense sent the Lava Bears into early hibernation with a 23-7 halftime lead. Once Craig got comfortable in the second half and the game opened up, the dual-threat danger did the rest. Using another all three phases of the game performance the Apollos bounced Bend with a 40-7 first round rout to send themselves to the second round of the 6A playoffs next week against Liberty. It was Sunset's first home playoff win since 2001. "We just did everything right tonight and it showed on the scoreboard," Williams said. "This gives us the confidence we need. We're all clicking together, we're all coming together. If we keep playing like we did tonight, we'll go pretty far in the playoffs, I think." The No. 7 Falcons, a familiar foe that once resided in the Metro League just a season ago, will host the No. 10 Apollos (6-3 overall) at Liberty High School next Friday. It will be the first time since Sunset has been to the second round of the postseason since 2014. Making the quarterfinals at the 6A level is a revered attainment considering the clout of the field every year. Now Sunset is just one winnable second round victory away. "Coach (Damien Merrick) said we set the expectation higher and it feels good to do that," Craig said. "For next week we're back to 0-0. If we lose, we go home, if we win we keep going. We want to keep playing as long as we can." Commend Bend for scheming up Sunset's explosive passing game for the first two quarters, a tall task considering the Apollos' explosive production through the air during league play. 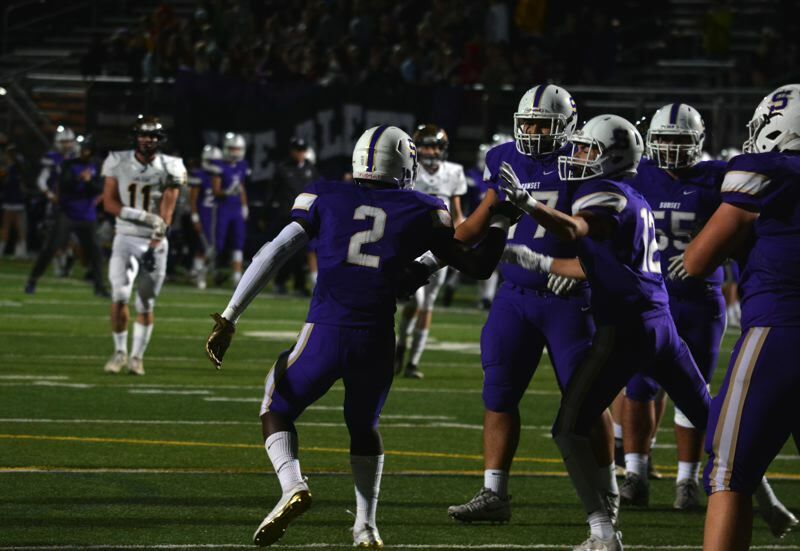 But the extra defensive attention paid to Sunset's aerial assault opened up the Apollos' churning, chunk-play gaining ground game headed by Williams and his burly, man-moving offensive line. Hunter Newcomb, Gustavo Mendez, Kanen Rossi, Taye Courtney and Joe Divine did the dirty work up front and helped open veins and lanes for Williams for big runs time and time again. They're a group that gets stronger as the game wears on, a quality Craig attributes to Sunset's high-paced practices during the week. "Our practices are very intense for them," Craig said. "For us, as (defensive backs) and quarterbacks we think we don't have a lot of time to get water, but (the o-line) doesn't have any time at all. They're going from one thing to the next and they're going 100 percent the whole time. They're always working hard, they're in the trenches working together and they work together well." As a former offensive lineman himself, Williams is fully aware his success rises and falls with the big boys up front giving him creases to run through. "They're just nasty, they want to go out and pancake as many people as they can," Williams said. "When they go out there like that and they play aggressive, I can just go right up behind them. It makes it easy for me." And when his offensive line mates gave him room to work, Williams was outstanding, patiently waiting for holes to open, exploding to the second level and finishing runs with his trademarked linebacker pop. Williams was a lineman for three seasons and his understanding of how to let his blockers get out in front and plow was apparent. The ex-guard piled up 105 yards and two scores to go along with 10 tackles and two sacks at linebacker. "It's that o-line vision," Williams said with a smile. "I went from the o-line to running back and that vision helps like crazy and then I try to add a little patience in there. I love being on the field and contributing in any way, I can. I've always wanted to play running back and I'm glad the coaches let me play it." "(Williams) has a certain respect for linemen because he hated playing it," Craig said with a smile. "Being at running back, where he wants to be, he wants to get something good done with the ball every time he touches it. He keeps doing great things." Courtney, Williams, Nyembo, Ben McMillan, Ika Nguamo and Connor Stevens continued to star as a front seven, racking up six sacks and a fumble recovery to go along with a pick from Halvorsen. 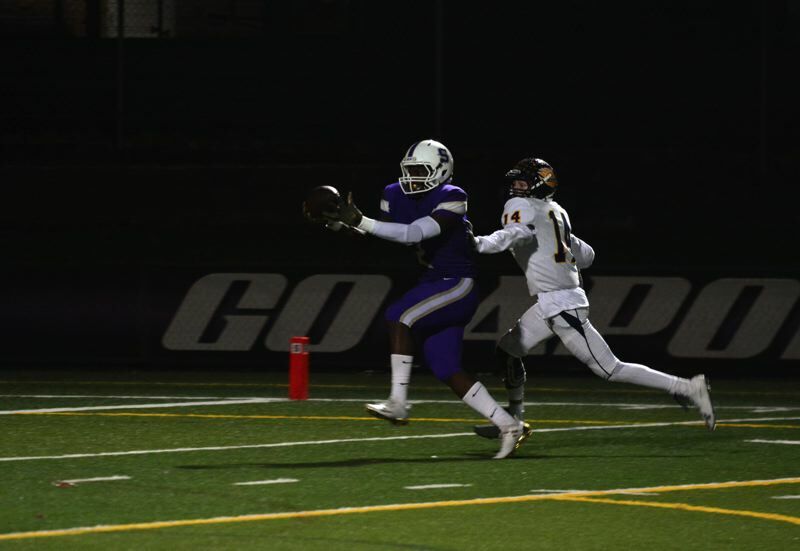 The Apollos sacked Bend on three straight plays in the third quarter, swarming the pocket, putting incessant pressure on the Lava Bear quarterback. Sunset scored in the first quarter on a wild play when Kyle Saigon fumbled around the Bend 40-yard line but senior tight end Marve Nyembo alertly scooped up the ball and with seemingly all 21 players frozen by the fumble sprinted to the end zone for the 40-yard touchdown to go up 7-0. Williams tacked on a two-yard touchdown run with 10:40 in the second quarter and Bend countered with a five-yard touchdown run to pull within 14-7 with seven minutes left in the half. However, as both team's offenses stalled somewhat, Sunset's defense swung the game. McMillan came up with a big sack and forced a Lava Bear punt buried at their own 1-yard line. Still up a touchdown, Sunset senior Devin Delgado collapsed on Bend's punter, who fumbled the ball and was forced to fall on it in his own end zone as Delgado dove on top of him to force the safety and extend the Apollo lead to 16-7. One free punt and three Apollo plays later, Williams burst through the offensive line, hurdled over a few strewn Lava Bears and landed in the end zone for his second touchdown of the quarter to extend Sunset's lead to 23-7 with 2:13 left in the half. "It was a huge momentum shift, it gave us a lot of confidence too," Williams said. "Everybody was being kind of neutral on the sidelines until we got (the nine points). That got us hyped after that. Then we started rolling in the second half." Indeed, Craig and company began to sync up in the third quarter. 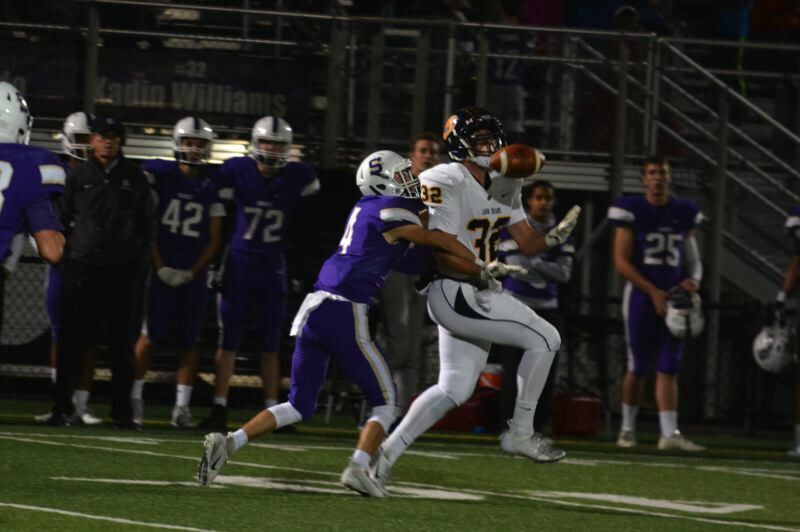 The explosive playmaking quarterback threw two interceptions in the first half, but in the second he was calm and cool, divvying up the targets to Nyembo, Aaron Krause, Nick Halvorsen, Jake Eilers and Nick Niedermeyer. On the first drive of the third quarter, Craig connected with Nyembo on a perfectly placed 46-yard touchdown pass and subsequently set up a Hayden Skiba field goal with a couple of highlight reel dimes to Nyembo and Williams. And in the fourth floating to his left, the junior lofted a tight spiral in between two Lava Bear defensive back to the towering Krause, who high pointed the ball, secured it and rolled into the paint to make it 40-7. Sunset awaits a Liberty team that some pegged as a preseason dark horse to reach the semis. 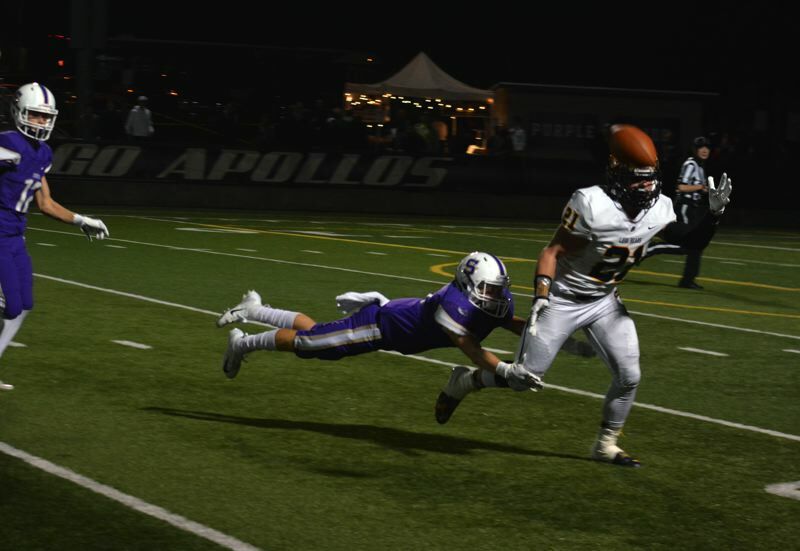 In the team's two prior meetings as Metro rivals, the Apollos beat the Falcons in each instance including a 35-25 prevailing last year. To Sunset, Liberty's elaborate spread option scheme and tricky offensive formations are nothing new. Craig's confidence is soaring with six wins and nine starts under his belt not to mention his recent first-team all-Metro selection. The Apollo defense is brimming with belief and getting better each week. Skiba is a threat whose long kickoffs put opponents in less than ideal field position. Sunset is hitting its full stride at the right time and goes to Liberty fully in tune with the task at hand.